The white food diet - will it harm your children? Home » Dad » The white food diet – will it harm your children? The white food diet – will it harm your children? More so than ever before, Americans are becoming increasingly aware of the harm certain "comfort" foods can do to a country already struggling with obesity. As a father, you've likely noticed that the available food options for your children are not always the healthiest choices. 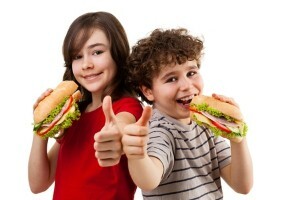 After all, children tend to encounter greasy French fries, processed frozen meats and sugary soft drinks at school. And outside of the cafeteria, fast food and snack companies are constantly looking for ways to market their products to children. According to the Centers for Disease Control, white-colored, processed foods like pasta, bread, crackers, rice, flour, cereal and other selections are high in "bad" carbohydrates. These foods cause the body to release extra amounts of insulin, which leads to increased fat storage and can result in diabetes. Unfortunately, too many children make these comfort foods a major staple of their diets. So how does one mitigate his children's consumption of these "white foods?" This may seem like a tricky proposal if your little ones are picky eaters (as so many children are), but it's important not to let a little whining pave the way for a lifetime of poor eating habits. However, eliminating all carbohydrates isn't the answer either. Carbs provide the body with essential fibers that are vital to healthy growth. Foods like fruits, vegetables, dairy and whole grains contain "good" carbohydrates and are far more filling than white diet carbs. While it would be nearly impossible to convince your children never to eat bad carbohydrates again, by moderating their diets with healthy food options along with the occasional junk food rewards you'll be on your way to establishing a balanced routine.